In Medieval times poverty was common. Failing harvests caused poverty among families, and the aged and infirm, who were incapable of working, added to the numbers. Help came from family members, but only when they themselves had the ability to provide it. The Church taught that it was a Christian duty to help the poor and they did their part. If there was a monastery in the locality, the monks gave out food to the poor and helped nurse the sick. But no-one had a legal responsibility to provide care for the poor, the aged, or the infirm. In the following decades many laws were made in an attempt to lay responsibility for care of the poor at a particular door. • In 1388 the Statute of Cambridge, often regarded as the first English Poor Law, introduced regulations whereby each “Hundred” became responsible for helping its own “impotent poor”, that is those who were unable to work because of age or infirmity. • In 1536 the Act for Punishment of Sturdy Vagabonds and Beggars made parish officers responsible for ensuring that the poor were cared for such that they did not need to beg. Funds were to be collected in a “common box’ and then distributed to the poor. In addition, voluntary funds, other than those collected in the common box, were made illegal so avoiding discriminatory giving. Many wills of the period bequeathed an amount to be paid into the “common box” in the church. This Act lapsed in the same year, but it formed the basis of responsibility in future poor laws. In the following years a system of poor taxes was established in London, Cambridge, Colchester, Ipswich and Norwich. Then, in 1572, the system was adopted nationally with the introduction of a local property tax administered by the Parish Overseers. • In 1597 an Act for the Relief of the Poor required every parish to appoint Overseers of the Poor whose responsibility was to find work for the unemployed and to set up parish houses for those who were unable to support themselves. 3) the persistent idlers, that is those who were able to work but wouldn’t. 4) provide relief to those who could not work because of age or infirmity and included providing shelter in almshouses or poorhouses. This act led to the creation of the first workhouses – not in name but in purpose. These houses were where out of work, able-bodied paupers were housed and fed and set to work in exchange for their keep. 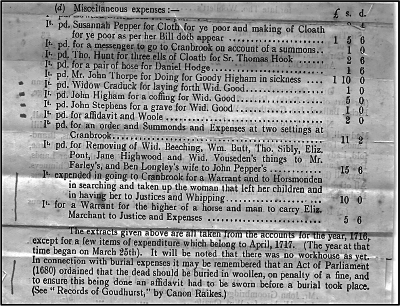 The first record we have of help for the poor in Goudhurst are copies of extracts of the Overseers’ accounts from 1675 to 1681. They list rates income from landowners and disbursements in respect of the poor. In 1716 The Churchwardens were Robert Tate and John Higham and the Overseers were John Pepper and John French. 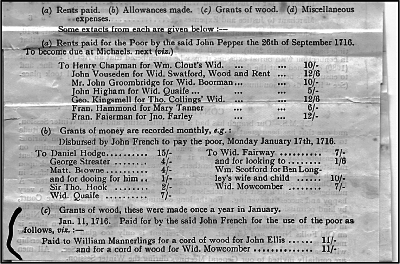 Their accounts list the poor rates collected from the landowners. 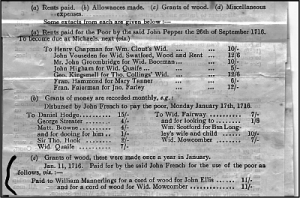 Also listed are their outgoings – rent payments made on behalf of poor folk to their landlords, allowances paid to paupers, and grants paid to suppliers for wood given to paupers. 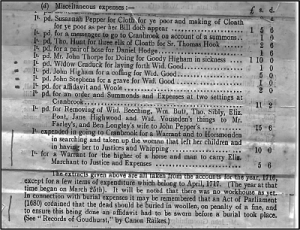 A further list of items is miscellaneous expenses in respect of things such as clothing, burial costs and the service of warrants. In 1722 Sir Edward Knatchbull’s Workhouse Test Act allowed parishes to build or set up workhouses, singly or jointly with neighbouring parishes. It also allowed Churchwardens and Overseers to purchase or hire a house or houses in the parish for the lodging, keeping and employing of poor persons. 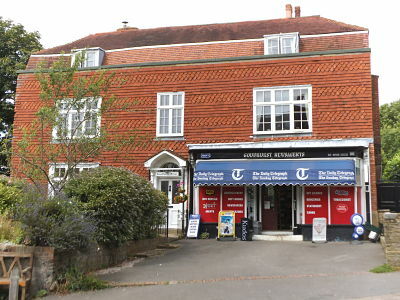 Goudhurst House in the High Street, now the newsagents, was the site of that Poorhouse. The Churchwardens and Overseers administered the Poorhouse and were responsible for inspections, discipline and catering. A Master was employed to care for the inmates and he was paid a salary. In 1744 the first mention of a Workhouse in Goudhurst appears in a copy of the ‘Rules of the Workhouse’ devised and agreed at a Vestry meeting on 3rd August that year. The rules covered everyone concerned with the Workhouse including the Churchwardens, the Overseers, the Master and Dame, and the inmates. The Churchwardens, Overseers and attending Inhabitants signed the final document at a Vestry meeting on 26 August 1744 and the rules were brought into play immediately. Inmates who were capable of working were sent out to work as labourers on farms, mending roads, breaking stones and flints, or simply fetching water, while the infirm wiled away their time in the Workhouse until the inevitable end came. The inmates didn’t receive direct payment for their work. Their wages were paid to the Churchwardens and Overseers who, in turn, used it to pay for the running of the house. The poor of the parish were still given out-relief when they were temporarily unable to work through sickness or injury. At a Vestry meeting in November 1744 the Churchwardens and Overseers agreed to “temporary relief in kind” being given to Richard Doe “on account of his broken leg” and to John Farmer “on account of his lame arm”. John was given a bushel of wheat per week whereas Richard was only given half a bushel. Clearly a broken leg was deemed worse than a lame arm. In December 1744 a new Master of the Workhouse was employed at the princely sum of 50/- a quarter. Outside there was a barn where wood was stored and the yard where 3 hogs were kept. A further inventory, made on 19th April 1749, details the rooms and their contents, much the same as in 1746, but also states that there were 25 people in the house. In April 1752, a Vestry meeting was held to choose a Master for the Workhouse for the coming year. The candidates were Thomas Weller, the present Governor, and Richard Rogers, a new candidate. Votes were cast and the result was 44 votes for Richard Rogers and 57 for Thomas Weller. Arrangements for running the Workhouse appear to have changed around this time. Rather than employing a Master with an annual salary, the position was put out to tender. Minutes of a Vestry meeting held in April 1763 indicate that the position of Master of the Workhouse was put out to tender and Humphrey Wickham won the position. As Governor he would have been responsible for the care of the inmates, including feeding and clothing them. He would also have been responsible for setting the able bodied to work and for making sure the children were taught to read. All this would come with a payment of 2/- per head per week for the first 30 inmates and 1/6d per head per week for any over that number. A proviso of his tender was that a workshop be erected at the expense of the Overseers. His income would have come from the wages earned by the inmates and from the sale of goods. However he was subject to a penalty of £10 if he neglected in his duty of care to the inmates. In April 1764 Wickham’s role as Master was agreed for another year but this time he would have 20 inmates at 4/- per head per week and 1/6d per head per week over that number. The penalty of £10, for neglecting his duty of care was again applied. In 1747 the Goudhurst Militia, under the leadership of William Sturt, defeated the notorious Hawkhurst Gang in a battle in the centre of the village. Several years later, in March 1765, William Sturt and his wife Elizabeth were made “Governor and Governess” (or Master and Dame) of Goudhurst Workhouse. They were to be paid £5.5s per year by quarterly payments and the minutes of the Vestry meeting show that he and his 2 children would be subject to the same rules and orders as the poor people. They were to be clothed and fed in the same manner as the poor at no charge but in return William was contracted to teach the children in the house to read, and to shave the poor, all for no payment. It seems William had fallen on hard times and maybe, out of respect for his past good deed, he was given a home in the Workhouse but with some dignity attached. The first mention we have of a hospital at the Workhouse is in the 1765 inventory where there are 2 rooms listed as the hospital and the shop over the hospital. In the 1774 inventory a hospital and an inner hospital were listed. The overall number of rooms listed suggests that the 2 rooms were a part of the original set up but were now used specifically to nurse the sick. The hospital rooms are listed again in the 1777 inventory. In 1788 the High Street Workhouse fell into disrepair and, in December that year, a Vestry meeting was held to decide whether the property should be repaired or sold and alternative premises purchased or hired to house the poor. A carpenter and a bricklayer were charged with carrying out surveys of the property in order to establish its true condition. The surveys showed a lot of work would be necessary to restore it, no doubt at considerable cost, and so the decision was taken to sell it. As a consequence, Messrs Ollive, Hanson, Williams and Springett, the Churchwardens and Overseers at the time, were instructed “to meet with Mr Tanner to discuss the purchase of his house and premises” which were, at the time, in the occupation of one Samuel Waghorne. The house and premises were at Clay Hill, and Clay Cottages became the new Workhouse. At the same meeting an agreement had been reached with William Hunt for his purchase of the old Workhouse such that he would pay £100 for the entire site or, if the part of the house that projected into the town, the hospital or the brewhouse buildings were taken down and removed to another site, he could have the remainder for £80. But, by early January 1790, William Hunt had failed to hand over any money. He was given a deadline to complete the purchase and, when the money was still not forthcoming, the property was offered to William Mynn, who eventually purchased Goudhurst Workhouse on 5th March 1790 for £80, the sum previously agreed with Mr Hunt. This lower price suggests that the hospital and possibly other parts of the premises were taken down and moved to the new site. William Mynn was the father of the famous cricketer Alfred Mynn, who was born at Twisden Lodge in Kilndown. Under William’s ownership the house became known as simply Goudhurst House. In addition there was the hospital building in the grounds which might well have been removed from the High Street and re-erected at the Clay Hill site. In February 1809 a Vestry meeting agreed that William Hazelden and William Christian would be joint Masters of the Workhouse. They would be responsible for feeding, clothing and housing the inmates, for teaching the children to read, arranging for nursing of the sick, and setting the able-bodied to work. In return they would be entitled to free lodging in the house and any profits and produce arising from the paupers’ work. They would also share an allowance of 4/6 per person per week plus a payment of 40/- for every baby born in the Workhouse, covering the period of one month from the day of birth. Thereafter they would receive the notional 4/6 per week. The Churchwardens and Overseers would be responsible for the maintenance of the premises, and the cost of any medical or surgical treatment necessary for the poor people. In 1810, in accordance with Knatchbull’s Workhouse Test Act of 1722, the Churchwardens and Overseers purchased a cottage and garden in Curtisden Green. Thomas Onions was the occupier of the premises and had clearly fallen on hard times. In 1811 the Churchwardens and Overseers agreed to purchase another cottage, garden and premises, this time in ‘Poiles Heath’, from William Golding, a sawyer, for the sum of £40. William would continue to occupy the premises. The full terms of the agreement are not stated in the Vestry minutes but, now that it was a Parish house, it can probably be assumed that William would be fed and clothed in return for the profits from his work, and the property would be maintained from the Workhouse funds. That every occupier rated at £4 pounds per annum would have one ticket for every £4 of rates he pays. On the first occasion this plan was used, all the tickets would be put into a bag on the Friday evening and every able bodied Pauper who was out of work would draw one ticket. The Pauper would be at liberty to work for that ratepayer during the ensuing week, or part week, as he chose. At the end of the week he would be issued with a certificate that would be filled in and signed by his master. He would then be paid an allowance thought appropriate for the work completed by a Select Vestry. If he chose not to work, or he conducted himself improperly during his period of employment, he would not be found other employment nor would he be paid. This drawing of tickets would continue weekly. The tickets that had previously been pulled out were not returned to the bag until it was empty at which time the whole process began again. In 1831 the census records showed that the population of Goudhurst had risen to 2758. Of those around 100 were inmates of the Workhouse. On top of that, about 165 families were given parish relief. The Churchwardens and Overseers had to raise £3286 in poor rates to cover their expenses. 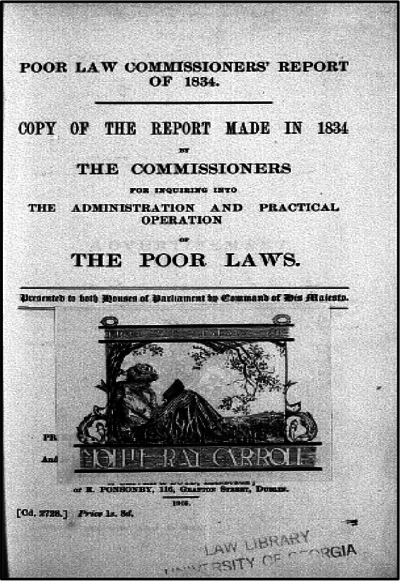 In 1832, the government appointed a royal commission to investigate the workings of the Poor Law and make recommendations for improvement. The commissioners sent out questionnaires and visited over 3,000 parishes (out of a total of 15,000) collecting information. Edwin Chadwick, secretary to the commission, believed that the system needed to be controlled by central government and it should be reformed in a way that would deter people from making unnecessary demands on public funds. 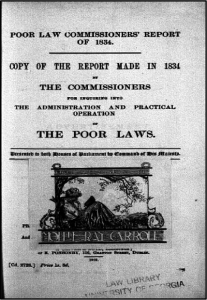 The commission’s report and recommendations were published in 1834. They had received wide support in Parliament having devised a way of providing an efficient government solution, but with a minimum of state interference and cost. The Poor Law Amendment Act was quickly passed by Parliament in 1834. It was a major overhaul of the old Poor Law and adopted all the commission’s main recommendations. A new government department, the ‘Poor Law Commission’, was set up in London employing inspectors to supervise the work of local officials. About 600 locally elected boards of guardians were set up to replace the old parish based system, each board having its own workhouse. Outdoor relief – the financial support given to the able-bodied – was no longer available to them so they would be compelled to work. Outside assistance was to be available to the sick and elderly, but in many areas assistance was only given within the workhouses where the regime was deliberately harsh and often cruel. A system was born where entering the Workhouse was to be the last resort. Conditions inside became a nasty shock for anyone thinking it would be an easy life for a crust of bread. We cannot know the actual circumstances of the families concerned but, in the responses to the Commission’s questionnaire, Goudhurst Churchwarden, Samuel Johnson, and Overseer, Isaac Bates, stated that 165 families in the parish had been given ‘out-relief’ in the preceeding year. If you count the number of men, women and children in these families, the figure rises to 829, almost one third of the population. Cranbrook Poor Law Union was formed on 3rd November 1835. The Union included the parishes of Benenden, Cranbrook, Frittenden, Goudhurst, Hawkhurst and Sandhurst. Each of the parishes elected 2 Guardians to the Board to represent them. Later that month a committee was formed to plan for a new Union Workhouse that was eventually built in Hartley in 1838. The inmates of Goudhurst Workhouse were moved to the new Cranbrook Union Workhouse from 1839. According to notes in the Goudhurst Coronation Book, the last Master at the Goudhurst Workhouse was Peter Page. It is said that he went on to be the First Master at Cranbrook Union Workhouse. The 1841 census shows that he was living in Goudhurst and his occupation was a Parish Beadle – the term we associate with Mr Bumble in Dicken’s Oliver Twist. The same census shows that Nicholas Rolfe was the Master at Cranbrook Union and his wife, Elizabeth, was Matron. Ironically, just 10 years later on the 1851 census, Peter Page was himself a pauper. When Goudhurst Workhouse closed, the various premises owned by the Churchwardens and Overseers of the Poor of Goudhurst, that is the Workhouse at Clay Hill and the cottages at Piles Heath and Curtisden Green, were advertised for sale by auction in July 1840. The Clay Hill site and the cottage at Curtisden Green were advertised for auction again in July 1842 so clearly did not sell in 1840. The 1842 tithe schedule shows that the Clay Hill site was in the ownership of William Colvill, a local builder, and that James Waghorn was one of the tenants living there. 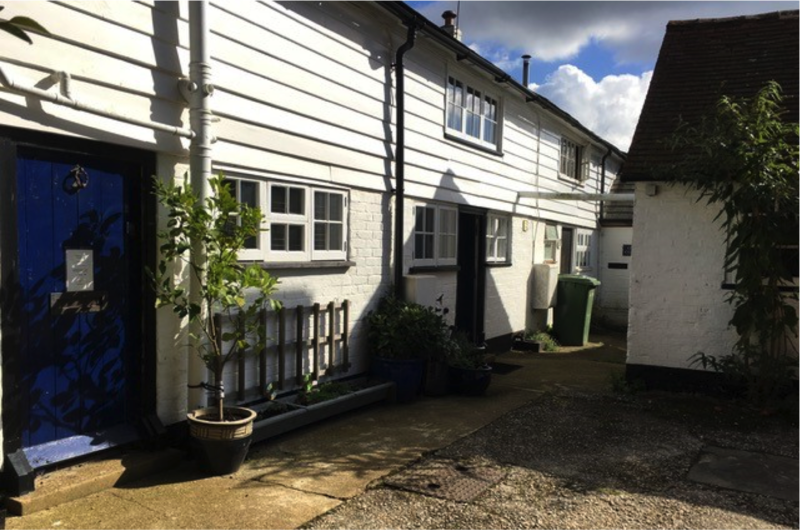 It is possible that William converted the workhouse buildings to cottages. In July 1856 ten cottages were advertised for sale by auction. 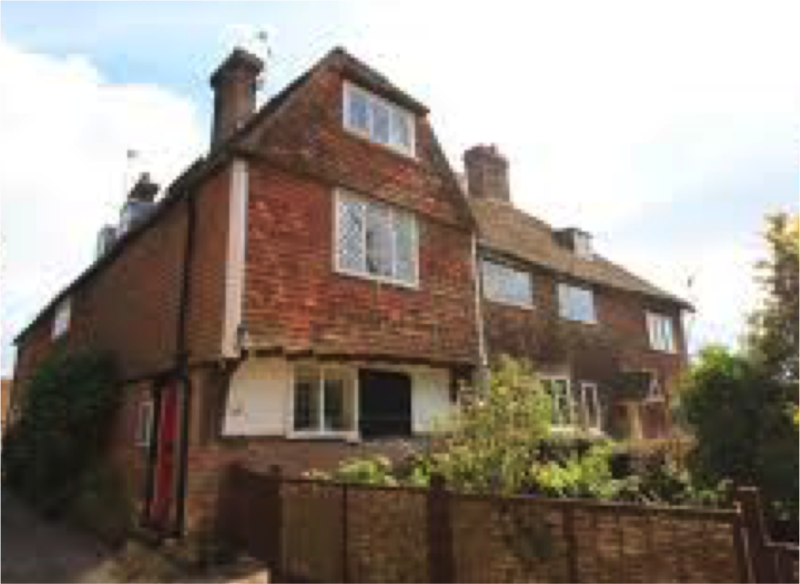 They were described as ‘formerly The Old Workhouse’ and fronted the road from Goudhurst to Lamberhurst. The y were let to respectable tenants at rents of £54. 12s. 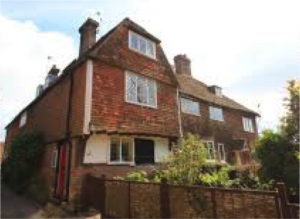 Whether they bought them in 1856 we don’t know but, in the 1870s, the cottages were said to be owned by Samuel Beeching (the High Street baker) and Edwin Lindridge (the North Road grocer). The two men were brothers-in-law. Different owners followed including Edward Hussey of Scotney Castle, who bought Clays Cottages, and The Oddfellows Society, who bought the hospital premises. Over time the buildings that were once the Workhouse and its hospital have changed hands many times and have been renovated to become comfortable cottages belieing their past as a last resort home for the destitute of our parish.